We hold a database of records for all major races distances from 1 to 100 miles. 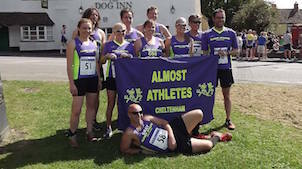 Take a look at the club records via the link below and if you can claim one of the records within your age group please email almostathletes@hotmail.com or nlewis@glos.ac.uk to let us know! You need to have been a fully paid up member of Almost Athletes at the time of the race - and records are open to first AND second claim runners. However, in the case of second claim members, the race MUST have been completed as an Almost Athlete. We will need the race distance and time, your age category and if possible link to the published results. Official split times can be used. Click link to view AA Club Records last updated 31st March 2019.